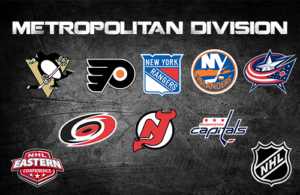 The Metropolitan division is half of the NHL’s Eastern Conference which was founded in 2013. It is made up of eight teams-Pittsburgh Penguins; Carolina Hurricanes; New Jersey Devils; Washington Capitals; New York Islanders; Columbus Blue Jackets; New York Rangers and Philadelphia Flyers. Betting on the Metropolitan division is quite exciting for US gamblers because of the long-standing rivalries between teams which ensures that games are always spirited. Due to the fact that the division is host to numerous high-quality teams’ bettors need to keep abreast with team stats and division statistics in order to bet profitably. Even though there are only a few seasons in which the Metropolitan Division has been in existence, there are ways to gauge how well teams perform. In the 2018-19 Season 38 to 39 out of 82 total games have been played by each team in the division. The overall performance of each team that is the number of games won out of the total played can be a good guide of how to bet on each team. Also study how the teams goal scoring and conceding capabilities are- i.e. the total number of goals for and against the team. The division is still fairly new, therefore the statistics of the division as a whole do not give much insight to bettors on how teams play in the division. However, the teams have been in existence much longer than the division and have in-depth statistics spanning a number of years. Out of the five seasons so far played under the Metropolitan division Washington Capitals have won three of them. While the other two titles have been bagged by New York Rangers and Pittsburgh Penguins. We look forward to seeing the 2018-19 season division title holders.